This image has to be one of my favorite "wedding details" images ever. It has also garnered numerous awards in various local, state and international professional wedding photography competitions.While a lot of wedding detail images simply document a ring, the bride’s shoes, the wedding invitation, etc. I like to create detail images that have a real personal connection to the bride and groom. 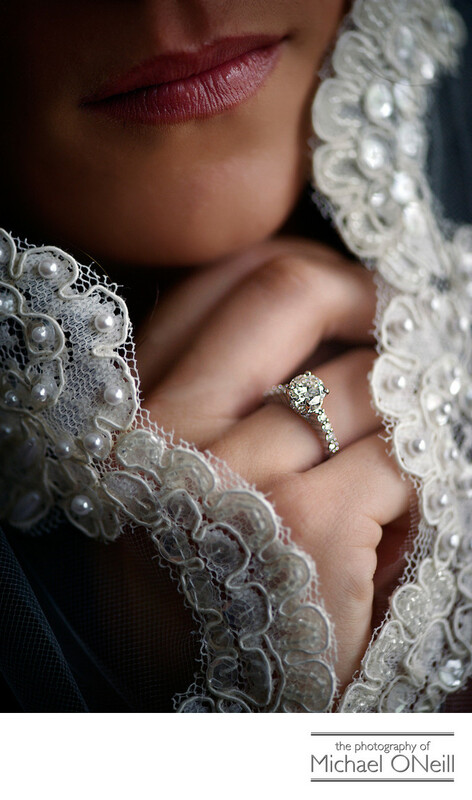 In this shot I delicately posed the bride’s hand with her stunning diamond engagement ring close to her lips and framed the entire shot with the lace appliqué on the edge of her cathedral length bridal veil. Using the flattering available light that was streaming through the window of the bridal suite in this fabulous Long Island mansion, I used a macro lens on my Nikon camera to capture all of the exquisite detail of her diamond engagement ring.You will put a lot of thought into all of the details that make up the theme of your wedding: your gowns, tuxedos, flowers, linens, favors, wedding cake, invitations, menus, centerpieces, cake toppers and on and on. Make sure you choose a photographer who knows how to capture all of the important details in a tasteful and elegant manner. I put the same amount of effort and passion into capturing all of the little details of your event as I do into creating the portraits of all of the important people that will attend.